Discover something beautiful each month with the lookfantastic 3 month Beauty Box subscription. Simply choose your payment option, and we'll supply you with a delightful Beauty Box each month. Sign up for our 3, 6, or 12 month subscription, and take advantage of our fantastic savings! Discover something beauty each month with the lookfantastic 3 month Beauty Box subscription. Simply choose your payment option, and we'll supply you with a delightful Beauty Box each month. Sign up for our 3, 6 or 12 month subscription options, and take advantage of our fantastic savings. Discover something beautiful each month with the lookfantastic 3 month Beauty Box subscription. *Payment for your Beauty Box will be taken upfront and your monthly box will be dispatched in the 1st week of each month. Payment for 3 months beauty box will be taken and you will not be charged in the next 2 months. Subscribe to the lookfantastic Beauty Box and save S$20 off the lookfantastic Beauty Egg Collection! Subscribe to the lookfantastic Beauty Box today and save S$20 off the lookfantastic Beauty Egg Collection when you use the code BEAUTYEGGBB at basket. 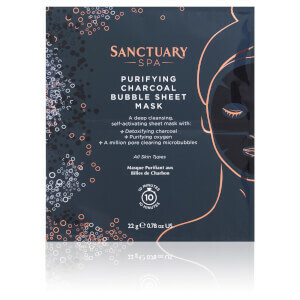 Enjoy a FREE Charcoal Bubblesheet Mask when you spend £15. Complimentary gift will be awarded at the basket. Offer valid for a limited time only, while stocks last. I received the box today and was really excited about it! All products smell amazing and the quality is really good!It is the anniversary box so i hope the next box will be just as exciting..I am really happy that i gave it a shot!